Was she evicted because she refused to take down her Peeps display? If you work retail, you cannot help but notice that our sacred holidays have been reduced to the lowest form of stupidity. We are coming up on Easter April 4th. This is the holiday of Peeps! I have a new heroine. Her name is Carol Burdick, and she lives in the Peoples Republic of Boulder, Colorado. Heath Urie wrote about Ms. Burdick this month in the Boulder Camera. Ms. Burdick claims that her landlord kicked her out because she would not take down her Easter decorations last year, which included the "bunny-shaped sugar-coated marshmallow candies attached to the top of her door." My fellow blogger (and fellow Wal-Mart cashier) Cliff Stewart and I have been talking about this phenomena of how we reduce our most sacred holidays to something totally unrelated to their sacred meanings, and we have talked about writing about this phenomena. Cliff has a wonderful blog listed on the right side of my blog. His is entitled JavaJazzJesus. He recently wrote a series of wonderful posts about St. Patrick, whose holiday we just celebrated by wearing green and getting drunk. I heartily recommend you go by Cliff's blog and read some wonderful theology from a man who is anything but holier than thou. Anyway, Ms. Burdick's trial begins in Boulder on March 30. The issue is "whether Peeps are a sugary symbol of artistic expression - or garbage." Do you think Cliff and I should make the long drive to Boulder to cover this trial? According to Urie, Ms. Burdick has scheduled witnesses from throughout the state who have an affinity for Peeps. The list of witnesses includes a Littleton couple who won a Peeps diorama contest and a Denver man who hosts an annual Peeps-themed barbeque. We may find that there is more to this complicated court case if Cliff and I get to digging around and doing some investigative blogging. For example, the landlord says Ms. Burdick was evicted solely because she did not pay her rent. Can you believe what is going on in Washington D.C.? Obamacare may become law without Congress voting on it? Huh? Legislation is pending in 37 states to oppose Obama's health care power grab. Idaho's governor signed a bill today to require the Idaho Attorney General to sue the federal government if Obamacare passes. Why? Because one of the provisions of the bill requires all Americans who can afford it to buy health insurance or face jail and/or financial penalties. Virginia has also passed something to prevent their citizens from being forced into Obamacare. Congressional procedural rules as set forth in the United States Constitution? The President of the United States says in an interview today with Fox News that he isn't concerned about them! Italians, Germans, and Russians all heard similar proclamations from their heads of states in the last century. Today was the first day we got into the 60 degree plus temperatures in 2010. 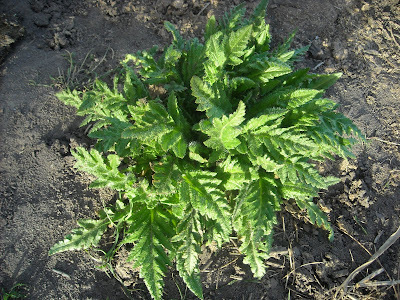 In honor of St. Patrick, I took this photo of some poppies that have recently emerged to welcome Spring in a few days. 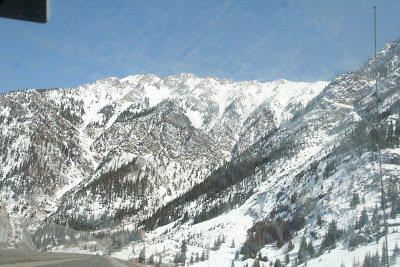 There still is plenty of snow in the mountains west of Denver. Give son Greg some scissors, cardboard, chalk, glitter paint, toothbrush, and paper, and you'll get a USA rocket soaring through space! 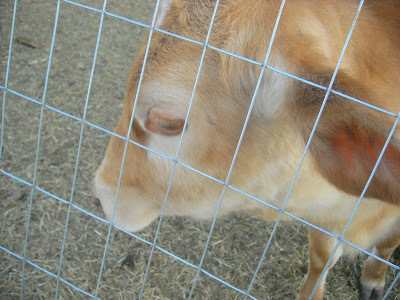 Cocoa is our newest Jersey cow. She is due to deliver her baby in April, as you can obviously see. 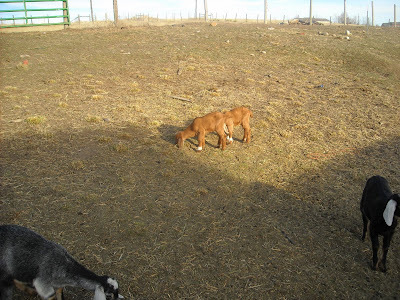 Our two newest baby Boer goats did not feel like posing for this photo today. 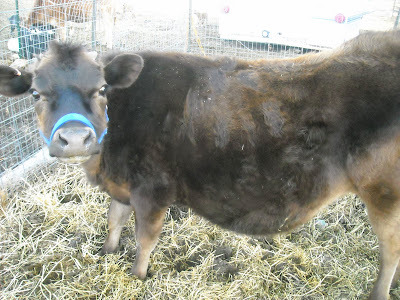 Rosie gives us a couple gallons of milk every day. Lucy, who I think has beautiful eyes, is Rosie's daughter. Delbert Elliot is the director of the Center for the Study and Prevention of Violence at the University of Colorado. Writing in today's Denver Post, he provides us with this list of short-term effects of marijuana: short-term memory loss, slower reaction time, difficulty studying and concentrating, lower performance levels, reduced driving ability and increased risk for accidents. Most states are strapped for cash, and looking for ways to get more revenue. Legalization of marijuana is increasingly seen as a way to accomplish more revenue. It's all about the money, folks, just as in the private sector! Increased use of marijuana can only make our nation weaker, just as has our increased dependence on alcohol and tobacco. Do We Really Want to Fool With Mother Nature? Did you know that the original species of American rainbow trout may now be extinct? Ken Ringle of the Washington Post writes that the rainbow has been "so hatchery-tweaked and interbred over the years that even DNA detectives puzzle over its exact genetic makeup." These hatchery bred rainbows have become rapacious predators who gobble up frogs and native fish, pushing some species to endangerment. Ringle writes that "even songbird and bat populations have suffered near mountain lakes when non-native rainbows consumed mayflies and other insects on which avian populations feed." Anders Halverson has written a book entitled An Entirely Synthetic Fish: How Rainbow Trout Beguiled America and Overran the World. As Ringle summarizes in the Post, "Once again, the evidence shows, it's a dodgy prospect fooling with Mother Nature." Tonight Kim is hosting a belated birthday slumber party. 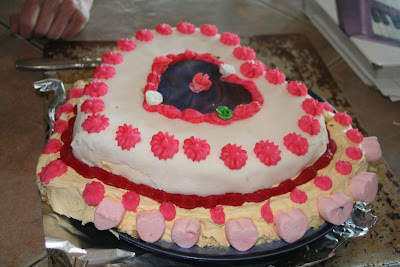 So, time for another cake, right? 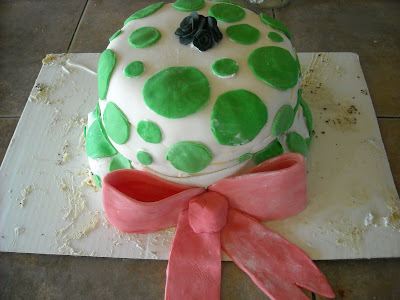 How about a St. Patrick's Day cake? 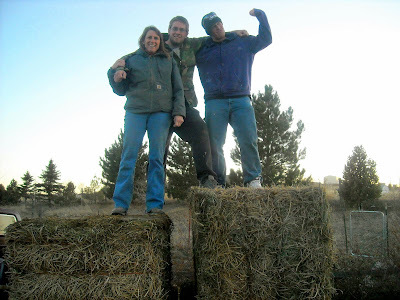 After unloading a truck of hay, Colleen and her two oldest sons are celebrating! Do you know you are eating genetically modified foods? Do you know how they are affecting your body? The Justice and Agricultural Departments are holding hearings across the Farm Belt on how to find ways to limit the reach of crop biotechnology giant Monsanto Co. Attorney General Eric Holder spoke today at the first of five such meetings. The issue seems to be that farmers and the seed companies that license genes from Monsanto are complaining about prices and limits on competition. Did you know that Monsanto has at least one of its patented genes in 90% of soybeans grown in the U.S. and about 80% of corn? I learned that from reading a March 11 Wall Street Journal article by Scott Kilman. A friend loaned us a book entitled Genetic Roulette by Jeffrey M. Smith. That book addresses what may be the health risks of genetically engineered foods. Are they causing sterility, infant mortality, allergies, organ defects, and other childhood diseases? In his introduction, Smith points out that the Food and Drug Administration (FDA) claimed that no safety studies are necessary, and that "Ultimately, it is the food producer who is responsible for assuring safety." This policy was put in place in 1992 during the Clinton presidency. Genetically modified foods thus have never been fed to animals in rigorous safety studies and probably never fed to humans at all are approved for sale in grocery stores! In the mid-1990s the UK government did institute rigorous long-term safety testing. Three years later its scientists discovered that "potatoes engineered to produce a harmless insecticide caused extensive health damage to rats." The trials funded or conducted by GM (Genetically Modified) crop producers, according to Smith, "typically fail to investigate the impacts of GM food on gut function, liver function, kidney function, the immune system, the endocrine system, blood composition, allergic response, effects on the unborn, the potential to cause cancer, or impacts on gut bacteria." It seems that Monsanto has quite a good thing going for it. When farmers buy HT (herbicide tolerant) seeds, they are required to also buy the company's corresponding herbicide. Another popular trait of GM is a built-in pesticide, which is inserted into corn and cotton DNA, where it produces pesticidal toxins in every cell. I think we need to know more about genetically modified crops. Why is there not as much information about this subject as there is about global warming? This is something that is going right into our bodies nearly every day!